Our Pyroes on Tour have already achieved a lot, but there is a drawback: we have a static set of components. Even if we can dynamically show components, change classes and we could even think of re-rendering a component to be something different, the reality is that we are constrained to the layout we have pre-defined. Our PyroDetailComponent which allows us to edit the name of a Pyro. Because this is already a separate component, it can also be served in a different route. Our AppComponent has already undergone several changes. A <router-outlet> tag Here is where the outcome of the routing will be deployed. Has a pyroes =  binding. This was previously in our PyroesComponent which was always active. But this will no longer be the case. AppComponent on the other hand, being the bootstrap component, is always active and can offer the binding to children components. 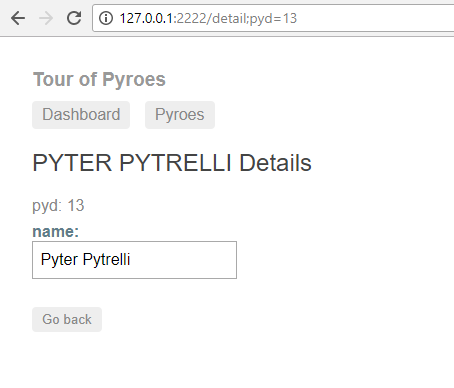 Kickstarts fetching the Pyroes from the service (remember the service is defined in AppModule, which will be shown later in this example) This was also in PyroesComponent before and has been moved over here for the same reasons as the binding. Has lost the import of the different subcomponents. This is because the components are now routing-dependent and the import has to be taken care of when designing the routing. Has a <button (click)=router.back()> which should be almost self-explanatory. self.router.back() could be seen as an install call and not as a call which has to be fired when the event happens. The machinery in AnPyLar will look for an ending parenthesis to detect this behavior and avoid making a call instead of a binding. The important part here: the component has direct access to the routing engine with self.router. There is no need to import anything and say anything special. The facility is there. Uses the loading and unloading methods. These are fired when the component is being loaded and unloaded from the DOM. Rather than recreating/destroying the component, what would be very expensive, the component is cached and given the chance to execute actions with each event. we’ll see the modifications to the service later in the doc. And as we pointed out above: `pyd would be a named param for the receiving component. As seen there, this can be accessed with self.params which acts like a standard dictionary. self.params is an alias to self.route.params where self.route is an object containing information about the current route which navigated down to this component. Done with the components. But this is about the routing and time to see it. The routing is declared in the main module of the applicaiton: AppModule in the routes directive. But to keep things clean and tidy will be declaring it in a separate module and importing it. This says that when the remaining url to be match is dashboard, the component to be put in play in the <router-outlet> is: Dashboardcomponent. And last but not least is the entry for the Pyro editor. Hitting the browser’s back arrow takes us back to the Dashboard and the forward arrow takes us again to the Pyroes part. All within application, not needed to go the network. 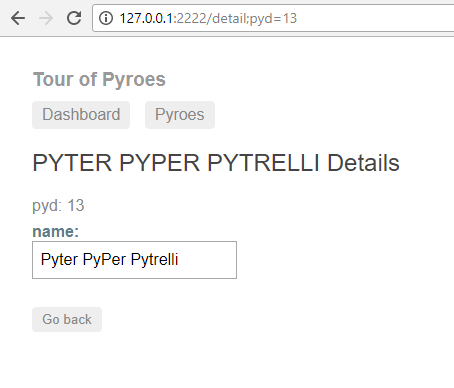 From either the Dashboard or Pyroes just click on the name of a Pyro and let yourself be taken to the editor. Notice that neither Dashboard nor Pyroes in the navigation buttons are highlighted. And that’s because the current route is neither of those. That’s how the component knows which Pyro has to be edited. Of course, in a real-life environment, things like authorization, existence of the pyd and many other things would need to be checked. That’s all … it’s about time to go to the network … in the next chapter. © Copyright 2018 The AnPyLar Team.